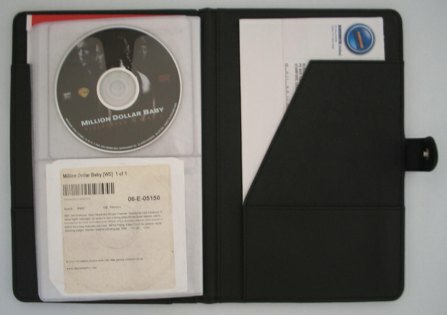 Nathan at Rentcaddy sent me one of his online movie rental organizers to review, and I liked it so much I bought it. At first I didn't think I needed one, but since I have up to 6 rentals from Netflix and Blockbuster at a time, it helps keep the pile of envelopes, DVD's and sleeves together (they were typically in a pile on my desk). The quality was much better than I expected, and it looks like a nice notebook. If you look closely you'll see that these are custom-made and have special sections for the DVD, sleeve, and envelope. The Rentcaddy costs $9.95 plus S&H.